For one of the most prolific and highly-praised cartoonists who ever lived, George Herriman, the creator of Krazy Kat (1913-1944), didn’t like talking about himself. Recoiling from photographers and brushing off personal questions with elliptical answers and even occasional fabrications, George or “Garge” or “The Greek” always preferred the focus to be on the multivalent, multifarious, and multicultural characters who populated the inner world he made every day with the scratchings of his pen. A direct throughline of thought-to-gesture in black ink on white paper, George Herriman’s drawings come alive before the reader’s eye with a vital, persuasive complexity previously unknown in the history of art. Krazy Kat lived on the page—but he—or she—had a secret. And so did George Herriman. Read the essay in its remarkable whole at “To Walk in Beauty,” then peruse Michael Tisserand’s Krazy: George Herriman, a Life in Black and White. 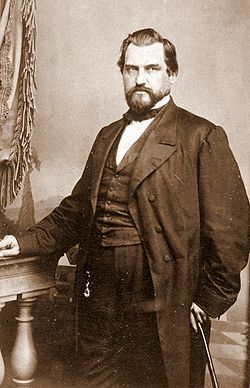 As we learn from the Masters, we might recall that it was on this date in 1863 that Leland Stanford, industrialist (and later Governor of California and endowing founder of Stanford University) drove the ceremonial “first spike” in the transcontinental railway in Sacramento, California. (Ground had been broken there just under a month earlier.) Stanford drove the ceremonial “golden spike,” celebrating the completion of the railway, at Promontory Summit, in the Utah Territory, on May 10, 1869.